British Warriors return to Wales for a six-bout show at the Llandarcy Sports Academy. Carmarthen’s Angelo ‘The Italian Stallion’ Dragone kicked off the promotion and his professional career with a 39-37 decision win against Reading’s experienced operator Ibrar Riyaz (6-145-4, 3KO). The debuting lightweight made a comfortable start in the opener. Dragone pressed forward behind short but snappy straight shots before he found room around the sides to score with body shots. The 28-year-old milkman’s compact stance didn’t initially give Riyaz a target to find but when he held his feet, Riyaz was able to enjoy his own brief moments in the second round. Keen to regain control and under instruction from trainer Richie Garner, Dragone reintroduced his jab in the third round and it put enough space between the pair for him to to stay on top. It was a pattern that repeated in the fourth round and Dragone’s extra energy saw him through. Cheshire’s Michael Horabin (1-3) recorded the first win on his slate with an entertaining 38-36 decision win against Cardiff’s David White Jnr (1-1). White, a 24-year-old featherweight, was straight down to action as the pair, equal in their enthusiasm, bounced off each other in the opener. It was the only session judged to be in the Welshman’s favour. Frantic exchanges also started the second round and White, clipped on the inside, found himself tumbling to the canvas. The southpaw returned south soon after, this time courtesy of a body blow as he sat on the ropes and rose on referee Chris Jones’ count of nine. Surprisingly, Horabin rested for the remaining two minutes of the round, seemingly content that he had banked a three point advantage. The two traded with less frequency in the third round and White obviously needed a big finish to turn the tide. A short right hook wobbled Horabin in the fourth and final round. Despite a frenzied follow up attack, it wasn’t enough to force a stoppage. Rhoose’s Lance Cooksey (6-0) recovered from an early knockdown to overcome Taka Bembere (1-3, 1KO) in an educational six rounder, judged 58-55 in his favour by referee Martin Williams. The combination-punching lightweight was instantly on the hunt, closing down Bembere’s space with a series of two-fisted raids. It led to a handful of clumsy clinches but proceedings quickly tidied themselves up and Cooksey clearly took the first round. However, Cooksey’s eagerness worked against him in the second round. The 28-year-old had the ducking visitor pinned against the ropes when Bembere sprung up and uncorked a flush left hook. 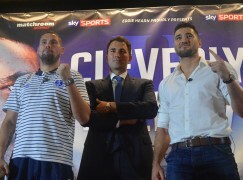 It sent Cooksey to the seat of his pants, where he composed himself and nodded to trainer Tony Borg before returning vertical. Cooksey came forward with more caution in the third and fourth rounds. Undoubtedly still the busier, the unbeaten prospect moved after he hit and made sure he didn’t stick around for Bembere’s response. It was a smarter approach and kept him in relatively safe territory with his weight, most importantly, now on his back foot. The fifth and sixth sessions were well paced as Cooksey looked to counter punch on the front foot. Bembere’s bombs remained present, though were telegraphed by this stage and easy for Cooksey to evade. Ammanford’s Jake Anthony (3-0) pounded his way to a 40-36 decision win against Somerset’s brave Bryn Wain (0-19), who sucked up an enormous amount of punishment in their four rounder. The 19-year-old middleweight was straight down to business, denting Wain with meaty body shots to both sides. They were single shots but their frequency remained constant and Wain’s grimace grew with every impact. Not keen to take many more, Wain attempted to smother Anthony in the second round. He stayed close and did his best to reduce the target area, only until Anthony became more creative and introduced powerful short uppercuts to reopen Wain’s guard and continue the body assault. Comfortable in retreat, Anthony attempted to walk Wain on to his work with increasing effectiveness. The west Walian was also able to increase the distance in the third round and then stepped in with solid power punches that bloodied Wain’s nose. 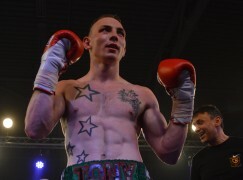 By the fourth round, Anthony was in full flow and refocused on the body. To Wain’s credit, the visitor didn’t wilt when many would have. Anthony’s cornerman Richie Garner reminded him not to ‘go wild’ and lose his shape, helping him to sail to the final bell as a clear victor. 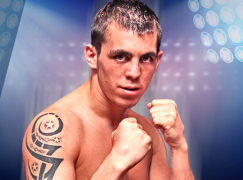 Swansea’s Jay Harris (12-0, 7KO) ended eight months of inactivity with an impressive shut-down of Nicaragua’s tough Cristian Narvaez (15-8-4, 1KO), collecting a 60-55 decision win over six rounds. The 27-year-old, trained by his father and former British champion Peter Harris, is a renown fast started and wasted no time in getting to know Narvaez. The two flyweights met shoulder-to-shoulder and were scarcely a metre apart in the opening three minutes. Narvaez switched stances in the second round in an apparent effort to discourage Harris’ momentum. It wasn’t completely successful as Harris proceeded forwards anyway. The unbeaten operator picked his moments to step in with thudding straight shots, pivoting to the sides before Narvaez replied. Harris remained constantly on his toes throughout the third round and in a position to engage. His anticipation was the difference and ensured his work was proactive and reactive in equal measure, whilst Narvaez was always second off the mark. Having grown frustrated with Harris’ dynamic upper body movement, Narvaez became more blatant with his attacks in the fourth round. The WBA Fedecentro champion attempted to dig his heels in and Harris recognised the opportunity to take advantage, now holding his feet to push Narvaez to the ropes courtesy of a couple of sneaky uppercuts. The first sign that Narvaez was feeling Harris’ power came in the fifth round. A series of one-two combinations shot down the pipe and landed flush on the button, discouraging Narvaez to engage and his gumshield was dislodged soon afterwards. The breakthrough almost came in the sixth and final round when Harris winded Narvaez with body shots, only to be denied by crafty veteran moves to kill the clock and survive until the final bell. It was Harris’ first fight in eight months and the Commonwealth champion is still to defend the belt he won 18 months ago in a Fight of the Year contender against ex-Olymian Thomas Essomba. Pontypool’s ‘Peerless’ Kieran Gething (6-1-1, 2KO) traded early knockdowns with Nicaragua’s Jorge Moreno (9-9-1, 4KO) and outlasted the visitor to score a fourth round stoppage. The welterweight instantly applied a constant stream of pressure, which didn’t work in unsettling Moreno, who stayed composed under the cosh. The visitor bided his time and swung wild hooks with both hands, finding the target with the right and forcing Gething to touch down in the first round. Wary of the wide hooks at mid-range, Gething had no interest in trading at range and opted to close the distance. The 24-year-old pinned himself to Moreno’s chest in the following session a return knockdown was scored – a left hook to the body sending Moreno in search of his ribs on the floor. The bell sounded straight afterwards but it didn’t disrupt Gething’s success as he continued with an avalanche of heavy hooks and uppercuts. He steamrolled forward for the next six minutes and a tired Moreno, with his hands at his waist, was stopped on his feet in the fourth round as Gething landed a sustained onslaught. 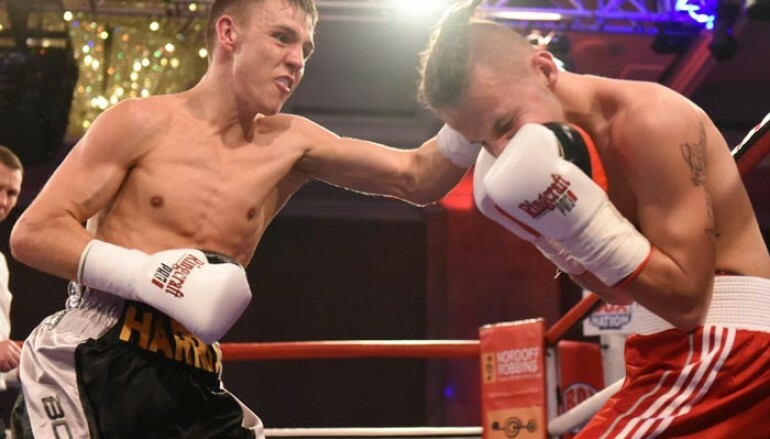 Gething, who is managed by 2002 Commonwealth Games gold medallist Jamie Arthur, had been expecting to face Basi Razaq (7-1-1, 3KO) in a title fight, only for the North Eastener to be ruled out with a hand injury earlier this week. 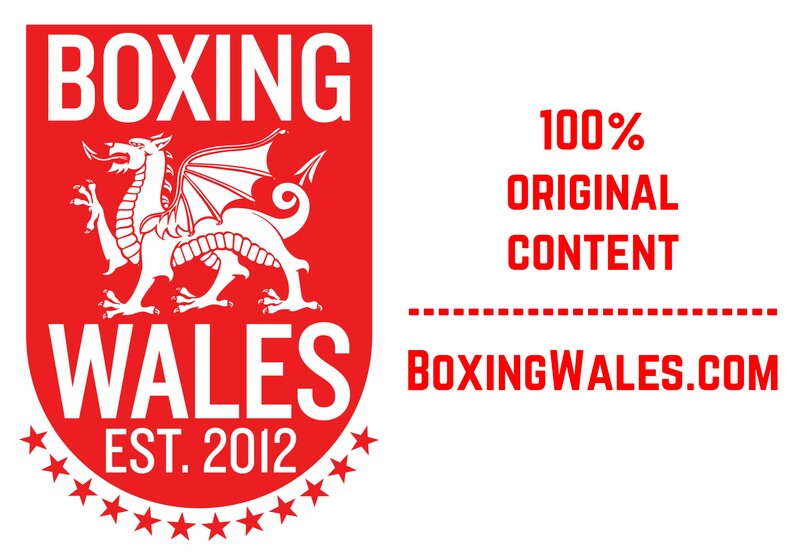 The welterweight, who is eager to fight for the Welsh title, will next be in action in his hometown on 28 September. 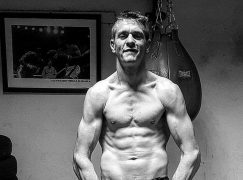 It was originally scheduled to be against Swansea’s Chris Jenkins (19-3-1, 8KO), who has since pulled out and understandably accepted a fight against the world rated Darragh Foley (15-2, 8KO) in Scotland.